Gone are the days when canola growers dialled in a standard five pounds per acre seeding rate – or at least they should be. Today, with wide variations in seed size from three to six grams per 1,000 seeds or more, one size no longer fits all. Also, considering that many growers are cutting seeding rates to save on seed costs, hitting the Canola Council of Canada’s (CCC) recommended target plant stand may not be possible. Ian Epp, a CCC agronomist, says the long-term recommendation has been seven to 10 plants per square foot, but that recommendation is changing. “In light of more recent research that looked specifically at current hybrids under modern planting conditions, we have somewhat reduced our plant stand recommendation, but more importantly, we have moved to a risk-based system, which helps farmers understand the risks and management challenges with various plant stands and the wide variety of planting conditions across Western Canada,” Epp says. He explains that to help farmers better understand many of the important factors that influence plant stands, the CCC launched an online target plant density calculator (available at canolacalculator.ca) that goes through some of the major factors that need to be considered when deciding on a seeding rate. Those factors include early season frost risk, weed competition, in-season insect damage and growing season length. Given the wide variation in seed size, the CCC also recommends farmers use its seeding rate calculator (found on the same website) to calculate seeding rate based on seed size. For example, if seed weighs six grams per 1,000 seeds and a grower targets five plants per square metre with a 60 per cent estimated seed survival rate, the seeding rate would be 4.8 pounds per acre. But, if the 1,000 seed weight is three grams, the seeding rate would drop to 2.4 pounds per acre to achieve the same target plant stand of five plants per square metre. 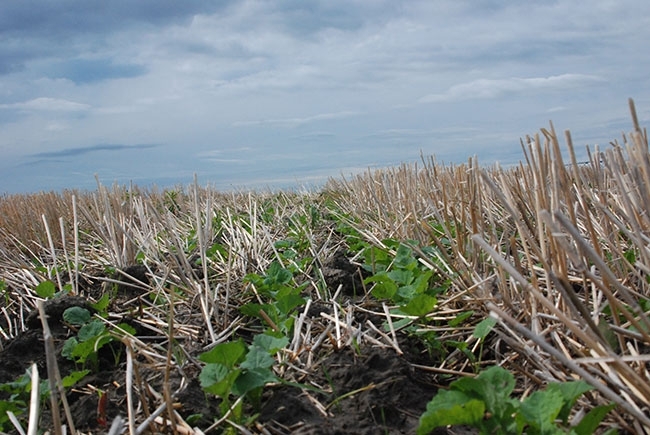 Recent surveys have shown that one-half of western Canadian canola growers have plant stands of less than 40 plants per square metre. This indicates that growers should put a renewed focus on choosing a seeding rate that focuses on target plant density. Research by Neil Harker, a research scientist with Agriculture and Agri-Food Canada in Lacombe, Alta., highlights the importance of considering seed size when calculating seeding rates. Speaking at the Science-O-Rama event hosted by the Alberta Canola Producers Commission earlier this year, Harker summarized two recently conducted research studies. In 2013, direct-seeded experiments were conducted at nine locations in Western Canada. Four canola seed sizes (1,000-seed weights ranging from 3.96 to 5.7 grams) and one un-sized treatment (4.4 grams on average) were seeded at rates of 7.5 and 15 plants per square foot. Across all sites, seed size had no effect on emergence, yield or seed quality. Higher seeding rates resulted in higher canola emergence and increased early crop biomass, 1,000-seed weights and seed oil content. The higher rates also reduced days to the start of flowering and days to crop maturity. “In this study, we didn’t find a compelling reason to go with a higher seeding rate,” Harker says. The second study was conducted in 2014 and 2015 at 16 sites on the Prairies. “Small” canola seed (averaging 3.32 to 3.44 grams per 1,000) was compared to “large” canola seed (averaging 4.96 to 5.40 grams per 1,000) at five seeding rates: five, 7.5, 10, 12.5 or 15 seeds per square foot. This study found larger seed resulted in greater stand establishment than small seed. However, this did not translate into a yield benefit. Large seed tended to result in greater yield than smaller seed at all locations, but the differences were not significant. The results also showed the seeding rate and seed size interaction was significant. For large seed, yield did not increase with an increase in seeding rate, but for small seed, yield increased with seeding rate. However, most of that significant yield increase occurred when moving from five to 7.5 seeds per square foot. Harker points out that at the lowest seeding rate of five seeds per square foot, the average yield of the larger seed was eight per cent (3.5 bushels per acre) higher than the small seed. Once the seeding rate was increased to 7.5 seeds or more, there was no difference in yield. Large canola seeds increased crop density and crop biomass, but decreased plant mortality, days to start of flowering, days to end of flowering, days to maturity and per cent green seed. Seed size did not influence harvested seed weight, seed oil content or seed protein content. Increasing seeding rates also increased crop density, plant mortality, crop biomass and seed oil content, but decreased days to start of flowering, days to end of flowering, days to maturity, per cent green seed and seed protein content. Harker says the two studies point out the need to balance seed size and seeding rate when establishing canola. Larger seed and a higher seeding rate provide agronomic advantages such as better weed competition from a thicker plant stand. Additionally, earlier flowering and maturity can also provide other benefits, such as avoiding heat during seed set and missing fall frosts that can hurt seed quality. “Getting a minimum plant stand of five plants per square foot will help establish a crop with good yield potential. Our research data supports that. As you get close to that line, you may not lose yield but you can run into other risk factors such as green seed, frost or delayed maturity,” Harker says. almost always experience a yield loss. His study emphasizes that farmers should manage their risk by considering all the factors in establishing a healthy, uniform plant stand. “I would never recommend anything below five plants per square foot and, ideally, like to see six to seven plants per square foot,” Epp advises. Count the number of plants in a one-metre length of row and calculate with row spacing to get the plant density. This approach is the most accurate, and tends to be used in research projects. Determine the number of plants in a 0.5-square-metre hoop and multiply the total by two to determine the number of plants per square metre. Count the number of plants in a 0.25-square-metre hoop and multiply the total by four to determine the number of plants per square metre. The CCC recommends growers avoid using a one-square-foot hoop or square to determine the number of plants per square foot, as that small an area will be less representative of the field, especially when canola is seeded on wider row spacings. Pipeline Foods acquires grain elevators in Sask.